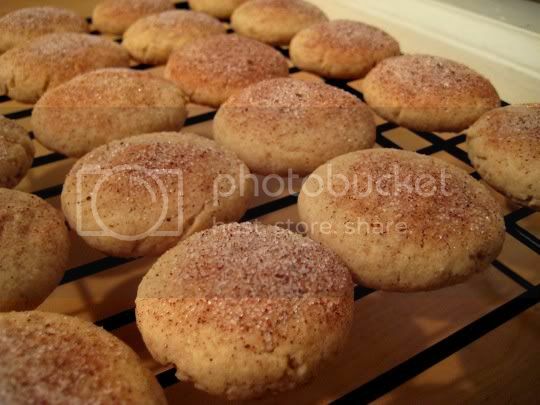 Your basic butter cookie, VERY similar to a snickerdoodle...but with a wonderful combination of fragrant spices: cinnamon, nutmeg, and a little ginger. Buttery, soft, chewy, and not too sweet, these are the perfect cookies to serve with tea or milk for an afternoon snack. They are very easy to make: your basic butter-sugar-egg mixture combined with the flour-spice mixture, rolled into balls, and baked. Before baking, they are generously sprinkled with a mixture of sugar, cinnamon, allspice, and nutmeg for extra sweetness and spicy. Be careful not to overbake these cookies. The suggested 9-minute baking time is just right (although I left mine in for 10), and they continue to "cook" on the baking sheets for an additional 10 minutes after removing them from the oven. This will yield the perfect cookie: firm and slightly crisp on the edges, and soft and moist inside. Make again? Yes. Great for a crowd and snacking.